The Dubey & Schaldenbrand brand, not widely known today, was founded in 1946 by Georges Dubey and René Schaldenbrand, though it has long ceased to be linked to anyone of either surname. Its current owner, Jonatan Gil, took over in 2009 at the tender age of 22 after purchasing the brand from Cinette Robert, who revived the brand in 1995. Today’s vintage piece is a watch is an example of the inexpensive split-second chronograph called the ‘Index Mobile’ that Dubey & Schaldenbrand produced during the 1950s and 1960s. A split-second chronograph has two chronograph second hands which run together, the upper hand on top of the lower. When the user wants to check an interval time, s/he depresses a button, resulting in one of the second hands stopping (to mark the interval time) as the other hand continues to run. After a reading or interval measurement has been made, the user depresses the button again, which results in the hand that had been stopped catching up with the hand that has been running continuously so that they again run simultaneously on top of each other. The ‘catch up’ is where the term ‘rattrapante’, which is often used for split second chronographs, comes from – the French for ‘catch up’ or ‘recover’ is ‘rattraper’. Split-second chronographs are complex, and were uncommon in the 1940s and 1950s. Dubey & Schaldenbrand, noting their usefulness, got it into their heads to develop a less expensive (production and price wise) version for the market. George Dubey did this by putting some of the inside, outside – an extra shaft holding the ‘split’ second-hand placed through the centre of the watch, and kept in place directly underneath the chronograph’s primary seconds-hand by a hairspring which connects the two hands and is fully visible to the eye. So, how does it work? When the chronograph function is activated, both the seconds hands move simultaneously. During this, split-second function is activated when the button in the middle of the crown is depressed. By pressing it, the user stops the split-second (index) hand, which applies a brake to the wheel turning the hand. When the button is released, this second hand, which has stopped, will ‘catch up’ with the other seconds hand which has continued running throughout the period being timed. The hand that stops while the other continues to run can be held to time a secondary event for up to 58 seconds, returning instantly to meet the other hand as the button is released. The Index Mobile achieved its goal of making split second chronographs more accessible to the watch buying public because it involved adding a few parts to inexpensive movements, from Landeron and Venus and making this complications more accessible to the watch buying public. This particular example has a stainless steel back, but you’ll find a range of dial designs and metals (gold/ steel) used in old Index-Mobiles. Pressing the split function button on the crown down is interesting if one is not used to it, especially if you are used to exerting a certain amount of pressure to operate a chronograph function, as it is quite ‘soft’. 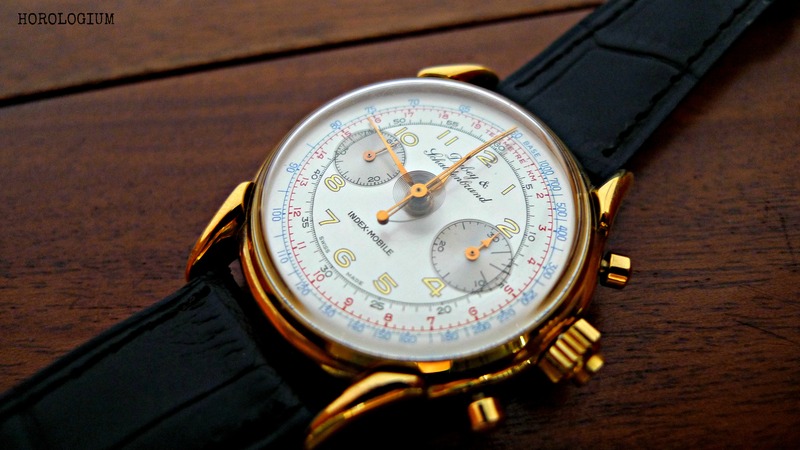 In the 1970s, Dubey and Schaldendbrand produced the Index Mobile chronographs for several other brands. In the late 1990s they re-issued it themselves, using new old stock Landeron 248 base movements but in a larger 37.55mm size case in stainless steel, 18ct gold and gold-plated versions, with a few dial variants. With its classic good looks, including the use of blue and red on the dial, this is a watch that will appeal most to those with an interest in vintage chronographs. It is an attractive and quirky piece. Although not widely known, this very unusual split second has a place in chronograph history, and should you find a vintage example, still affordable, as was intended by George Dubey. Delightful vintage piece! Thank you for the great article…I shall begin to scour the 2nd hand markets for one of these! That’s a lovely clean example! Jealous I am.